CLEVELAND — A suburban Cleveland police department has suspended a white officer without pay for 15 days after he was seen in a cellphone video repeatedly punching and hitting a black man's head on pavement after a traffic stop for a suspended driver's license. Euclid Police Chief Scott Meyer announced the suspension at a City Council meeting Monday, saying it was the maximum number of days he could give officer Michael Amiott under departmental rules. Meyer said he would recommend that the city's mayor impose an additional unpaid suspension for the Aug. 12 incident. The cellphone video viewed more than 7 million times on Facebook has sparked outrage across the country. 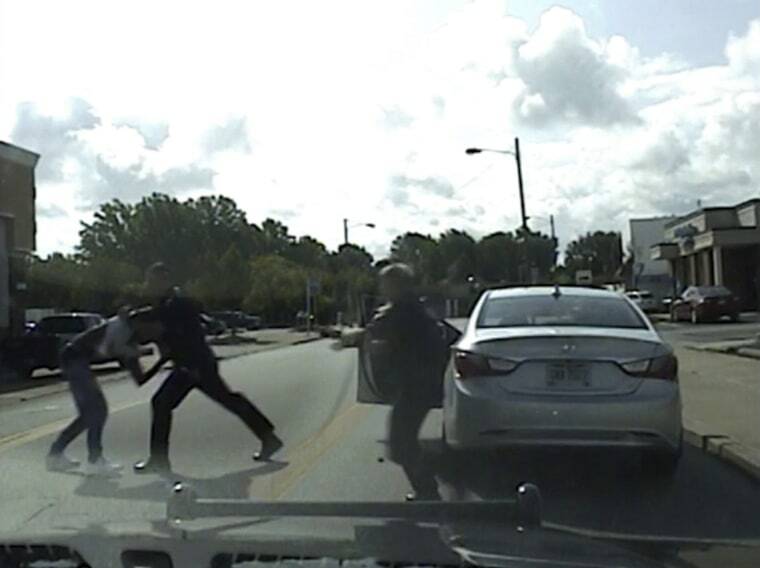 A police dashcam video shows Amiott wrestling 25-year-old Richard Hubbard III to the ground within seconds of ordering him to "face away" after Hubbard steps out of the car. The police union that represents Amiott did not respond to a message Wednesday seeking comment about the suspension. Hubbard's attorney has said the dashcam video clearly shows Amiott didn't give Hubbard a chance to comply. The cellphone video shows Amiott punching Hubbard more than a dozen times and hitting his head on pavement several times. Some of the punches came after it appeared that Hubbard had spread his arms out while lying on his stomach. Euclid police initially said Hubbard refused to follow orders and resisted. Hubbard was charged with resisting arrest and driving under suspension and released that day. Hubbard has a court hearing Thursday morning in Euclid Municipal Court on the misdemeanor charges. Four days after the arrest, Meyer and Mayor Kirsten Gail issued cautiously worded statements that said the incident would be investigated. The police union that represents Amiott did not respond to a message Wednesday seeking comment. The union said in a statement last week that the public shouldn't "rush to judgment" about the arrest. Meyer said Amiott also must undergo 80 hours of training on use of force options and human relations and that he's been removed from the Euclid police SWAT team. When Amiott is allowed to resume patrol duties, he will be assigned to training officers for a minimum of 60 says, Meyer said. The chief said he would recommend to the mayor that she fire Amiott for any "further similar violations" of departmental rules or policy. Amiott has had a spotty record as a police officer in Euclid and in Mentor, a suburban Cleveland department that allowed him to resign rather than be fired in April 2014 for lying to other officers about why he stopped a man for a suspended license. He was hired in Euclid five months later. His Euclid personnel file shows he has been reprimanded for hitting a driver with a handgun, mishandling evidence, losing his temper in front of his commanding officer and being involved in two crashes in police vehicles.